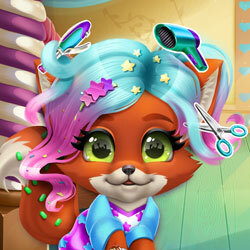 Description: Vixy is an adorable little fox who loves sweets! She's decided to have a change of look recently and it's up to you to give her a fun new haircut! Then you can add all sorts of delicious accessories and colorful clothes to complete her new look!